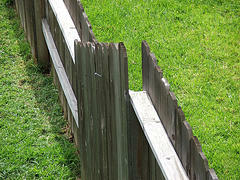 You of course know the phrase about the grass being greener on the other side of the fence. Sometimes, though, the grass is plenty green on THIS side. I thought of that this weekend when perusing some job search survey data. I’ve posted before about playing the odds in your job search. And you have to figure that a good percentage of job openings are filled internally. This of course makes sense. Searching for new employees can be time consuming and expensive for an employer. They stand to save themselves a lot of hassle if they can just promote from within. Internal hires also have the obvious benefit of being a known quantity. If you’ve already proven yourself as a good worker, then you’re a safer bet than a stranger. So the very first thing you should do when beginning a job search is to look around your current company or organization. If your current employer has openings (and if you can stand to stay with the same employer) you have to figure a lateral move is a pretty safe bet. After all, you’re more likely to be considered and the process won’t be a long or complicated. Especially in a tight job market like this, the safe bet is to consider the options on your side of the fence before jumping out into the wilds of a job search. My place of employment only promote the cronies/clique members. The same people are the ones getting the promotions all the time. Does that mke them more qualified? No! Our employer then instructs the very same people who applied for the position to then train the person that got promoted! But what?!?! If the person who was turned down for the job is more qualified than the person who GOT the job has to train the person … I live in Bizzarro World! My husband has worked for a family owned business for 10 years and loves the enviroment but disagrees with the organization. He thinks he can make things run smoothly and make the company more money at the same time. How does he approach the boss about this new job creation? The title speaks for itself. Stay for the meantime in your current company. When the economy becomes better – look for another job… a better company. I’m sure I’ll make use of this site again.